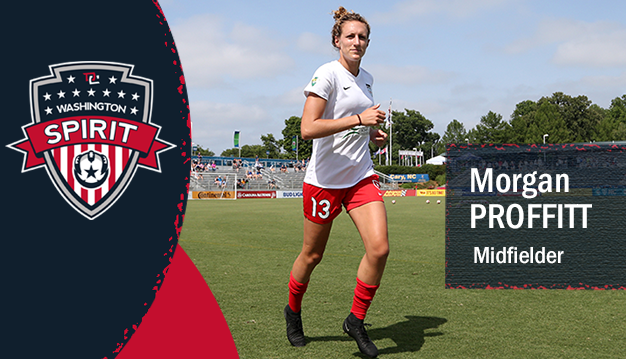 Boyds, MD (August 23, 2017) – The Washington Spirit has claimed U.S. U-23 Women’s National Team midfielder Morgan Proffitt off waivers. Proffitt, a 22-year-old rookie out of Marquette University, was waived by the Chicago Red Stars earlier this week. The 2016 Big East Conference Player of the Year was drafted with the No. 12 overall pick in the 2017 NWSL College Draft by the Red Stars, and played in seven games with the club, starting one. Since 2016, Proffitt has been included on multiple U.S. U-23 Women’s National Team rosters. After attending training camp with the team in April 2016, she was among 20 players selected by head coach Janet Rayfield for the Nordic Tournament in England last summer, and helped the U.S. win the international event. Proffitt was called into U-23 camp again in early 2017 at the U.S. Soccer National Training Center in Carson, Calif.
A native of Columbus, Indiana, Proffitt attended Columbus North High School and played youth soccer for Carmel United Soccer Club.